After the Welsh team put in such a awful performance against Australia on Saturday, it was fantastic to see the Under 9s put in their best performance of the season so far against CRCC on a cold Sunday morning down at Pontcanna Fields. The team showed their commitment today, coming from behind to win the first game and draw the second. It was a brilliant result considering we played two games back to back (CRCC had 2 teams!) and we only had 2 rolling subs! Throughout both games, the tackling from every player out there was brilliant, the boys put pressure on CRCC resulting in 4 turnovers in the second game alone. We had superb individual trys and superb team trys. In both defence and attack, the boys played as a unit. 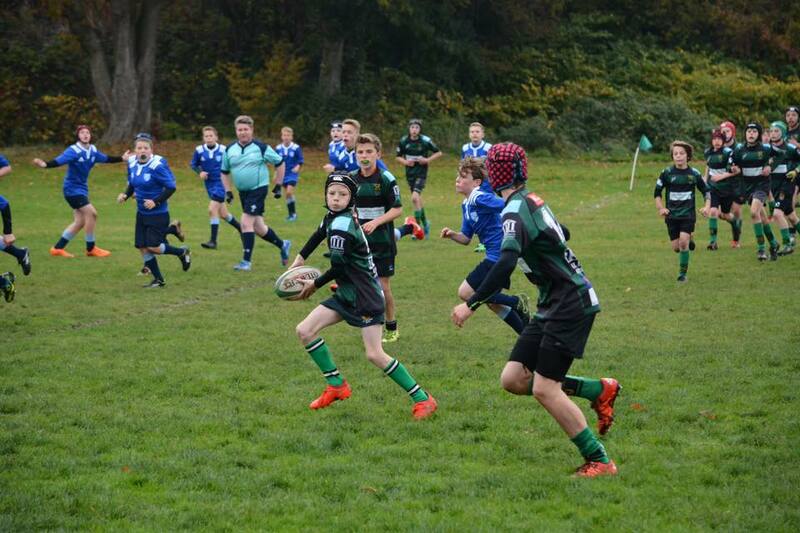 The boys were offloading in the tackle and running great lines of support. Jack, Jack, Harry, Jayden, Dylan, Rocco, Sebastian, Finlay, Noah, Ollie, Ryan, Zack – well done boys!! The last outing of the season for the Rocks involved a long trek by coach to Belfast via Dublin for the Malone Minis Festival. Sunday started with a match against the hosts Malone Lions, one of the best teams at the Festival. In this first game the Rocks found to their surprise that tactics in Northern Ireland are different to those in wales, particularly at the lineout where competing is allowed. Indeed, according to Malone parents that I spoke to, the teams in NI compete at every part of game. However, the Rocks soon adapted and a very hard fought battle ended with honours even. The second game against Monkstown was relatively straight forward and resulted in a large Rocks win, as indeed did the third group match against Gorey Green. Interestingly, it appeared that Malone had switched teams for their second and third games, so that although they also recorded sizeable wins, the Rocks topped the group on tries scored (13 to 10). After a process of harmonisation, the Rocks found themselves in a second group stage with Bangor and Gorey Red. The Bangor boys were big and played a very tough and bruising battle against Gorey Red who retired from the rest of the day due to injuries (the ref decided to stop the game early). However, the Rocks were up for their game, and the two largest Bangor boys went off early after bruising tackles from the Rocks; the game ending with a Rocks win. As Gorey had retired this appeared to be an unsatisfactory end to a great day’s rugby with the Rocks not only unbeaten, but without conceding a try. However, with the agreement of the other best team of the festival Wrexham, Mike Westy managed to arrange and unofficial playoff. A very tough game saw the Rocks home with a 1:0 win. Overall an excellent day’s rugby with all the shirts playing their part. The long-awaited St Peter’s Westy Rebels tour to London Irish got underway with a hard fought 1 try to nil start against Teddington RFC as a wake-up that this would perhaps be a tougher day for the Rocks than some may have thought. However, this was followed up by a relatively straightforward 4:1 victory over the Dutch Team Haagsche. At this point in the day Stato (who had been keeping any eye on the other teams) noted that the main rivals were the English team from Hertford and the German team from Frankfurt, both of whom had won their two opening matches, resulting in the Rocks in equal second place at this stage with Frankfurt, and Hertford as leaders. The Rocks’ third match was against the French team Massif (from Paris) who were only beaten by Hertford 1:3, so obviously no mugs. However, the Rocks cruised to an easy 6:0 victory. At the same time Teddington came to the Rocks’ aid by beating Frankfurt, leaving the Table at 1:2 for Hertford and The Rocks. The final game for Hertford saw an easy 6:0 win against Clontarf A. This left the Rocks needing to beat Ealing by 7 tries in their last match to take the cup. Alas it was not to be and the Rocks gave away a try in the first minute, although they came back hard to manage a 3:1 victory. Overall an excellent performance by the Rocks against some good opposition at 2nd place of nine teams in the Table. One bit of frustration, however (particularly for coach Chris who was relishing a match against Hertford), the rules stated that although both Hertford and St Peter’s ended on a tie at 4 wins each, the cup was decided on try difference rather than a playoff. 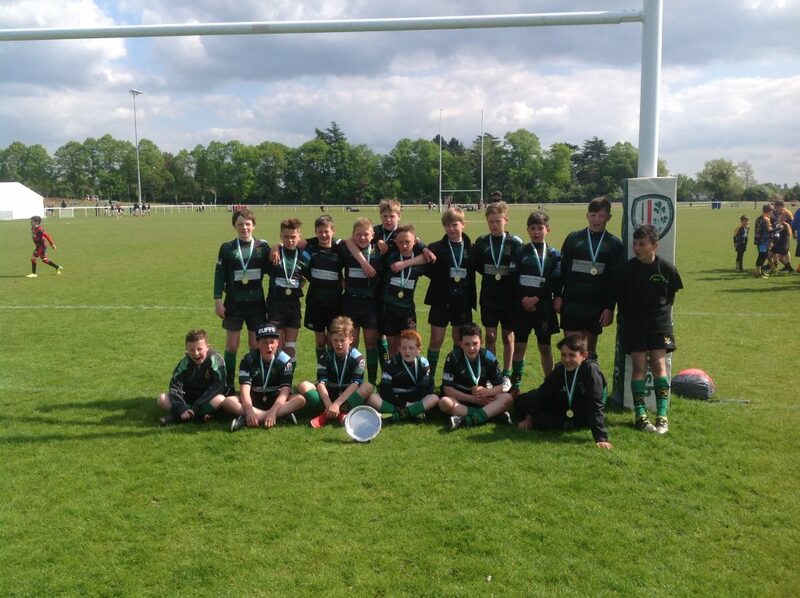 Thus Hertford took the Cup and St Peter’s the Plate. 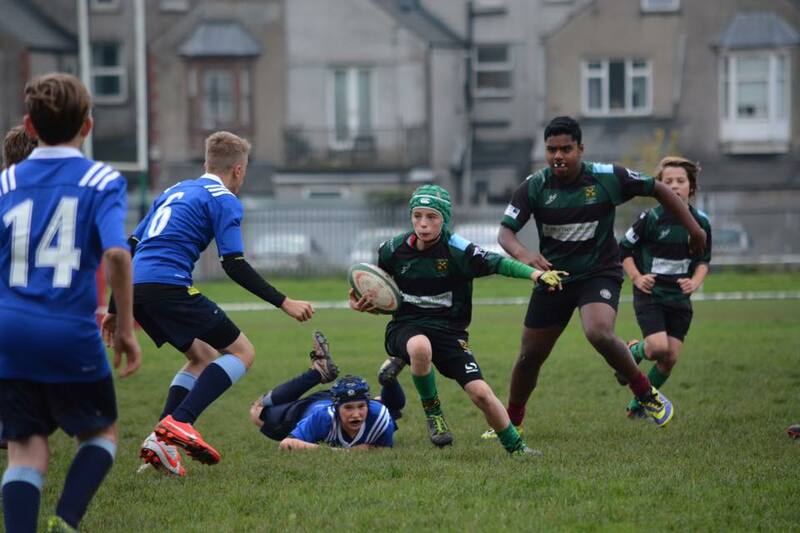 Treochy try in second half. Report by Denfa (Edited to include posh things – like full stops and grammar). We played two games this weekend, against probably the most awkward team we have encountered to date! I say awkward in the kindest terms, as we knew nothing about them apart from they were from a private school down south – and that the ‘Pembrokeshire Massive’ had arranged a get together with the folks from St. Peter’s hosting their shirts. Caldicott RFC had taken care of events on Saturday, by hosting our team at the Japan match, which truly was a lovely gesture – Thank you. The Friday evening match was played under floodlights at home – with puddles the size of Roath Park Lake – took place in the wake of Storm Angus. St. Peter’s took to the Harlequins fielding all 31 players against an eager but rather smaller squad of 24. The warm up (or should I say the how to keep dry up) took place with both teams eyeing each other up from afar with forwards and backs making traditional nervous comments to each other such as ‘look at the size of that one’, ‘how old is he really?’, ‘he’s got a beard’, and the like. As we all know, most under12s have giants and goblins in their midst, and its usually the giants thinking that the other sides are huge! The game was set at 25minute halves, with arm bands and water wings issued to the weak swimmers. Waders and brollies were banned. The whistle went with Steptoe declaring the customary “Let’s play darts!” Caldicott had decided to receive the kick off whereupon all hell broke loose with wave after wave (no accidental pun intended) of attacking Caldicott rugby down the 15yard line. The visiting forwards took the ball up and recycled – forwards ploughing into forwards; popping and off-loading at will against a stalwart, if somewhat shell shocked, Rocks defence. The try line was defended Somme like – a yard gained a yard lost! Just over a metre if you’re a young’un. Steptoe refused to blow his Acme Thunderer from sheer enjoyment of the bloody, muddy spectacular. The handling and defence from both sides was gladiatorial and took the breath away from the enthralled and thronging crowd who had braved the Friday elements of the Hallowed Harlequins. You know the type of Welsh Weather we mean – the rain that soaks you through to the skin without seeming to penetrate your best Burberry. Rain that has the knack of somehow making your armpits moist and the small of your back cold – as if your best pullover was exposed to a lazy wind. Wind so lazy that it doesn’t go round you but straight through you. After what seemed like a month, the Steptoe’s pea came out of hibernation and announced itself; a scrum was awarded to our visitors from England’s green and pleasant land. Having never had an 8 man scrum both flankers made the front row five strong rather than it’s traditional trio. The purists would be most upset. Following some light coaching, a reset and some more light coaching, the visting scrum half passed a rocket of the pass to his half back partner, which was swiftly passed on and if not for the only tackler to be half committed, the player went half down for Caldicott to get their reward. Five – nil to the valiant visitors. Arrdderchog, as they say on Waterloo Hill. The game resumed with the Rocks coaches calling their men to arms rather like the 24th and 41st afoot at Rourke’s Drift. The pitch was so wet by this point that the next phase of play took part in the deep end. The ref had to stop the game every time a tackled player was in the need of mouth to mouth resuscitation. On one occasion the RNLI were contacted and the first aiders had to come on with life jackets after flairs were fired. However hard the Rocks tried to breach the Maginot Line, they were repelled. By half-time Caldicott’s kit, which at the start of the game was a brilliant white, had turned the colour of the arena. It was like watching a Persil advert backwards. St. Peter’s made 15 changes to the team, brining on the stronger swimmers for the second half, and the game went on much in the same vein as the first. St. Peter’s gained parity after 2 minutes with a slick handling move down the centre. Five a-piece. Steadfast and true the game went with the same agenda. Hard rugby played by hard young men doing their best in conditions which Noah would have found impossible. St. Peter’s again broke free from the mire with 60 yard flourish. Ten-Five!. By this phase of the game, the fresh legs had made their mark. Possibly too, the weight of the Caldicott shirts dragging their shoulders down with sodden cotton. S. Peter’s now had gained the ascendancy at the break down and without little effort from Caldicott who unfortunately, gifted not one yard. The result however, was finalised by two further tries ending in a score line rather flattering the St. Peter’s shirts. On another day (hopefully soon) and with a different the rub of the green, the score could easily have gone the other way… After hearty cheers from both sides and a full team photo under the posts – the moon shone down on sodden fifty-five who had given their all. More traditions unfolded as plaques were presented and speeches were made. The coaches of Caldicott were keen to see what else Cardiff had to offer as the evening ended with the prospect of rugby dwindling with another downpour of biblical proportions. The next day – after an evening of banter, food and mums washing and drying any under-armour kit. Boots ruffling their hosts hair and making sure their wards were warm and fed. Everyone was suitably refreshed – eventually met at the old Julian Hodge building now a Holland House hotel or the Mecure. Mr Hodge (Jules to his mates) was a former patron of St. Peter’s – another coincidence and quite accidental. Wales v Japan. The less said about that encounter the better. Although I did hear a whisper on the interwebby thing that there was more rugby at the Hallowed Harlequins the evening before!!! Mike Wetson conjured up a venue for the return game down the house of sport 4g pitch. He had drunkenly bid for at a charity auction. Cheers Mike. Fortune favours the brave or was it tequlia!!! Sunday gifted us the rare glimpse of the, all too unfamiliar, current bun and the array of Chelsea tractors on show brought parts of Canton to wonder if Abramovich had put in a bid for Cardiff City. The Caldicott faithful had turned out (da iawn) and a few Rocks had been injured so they were down to just 28 shirts. 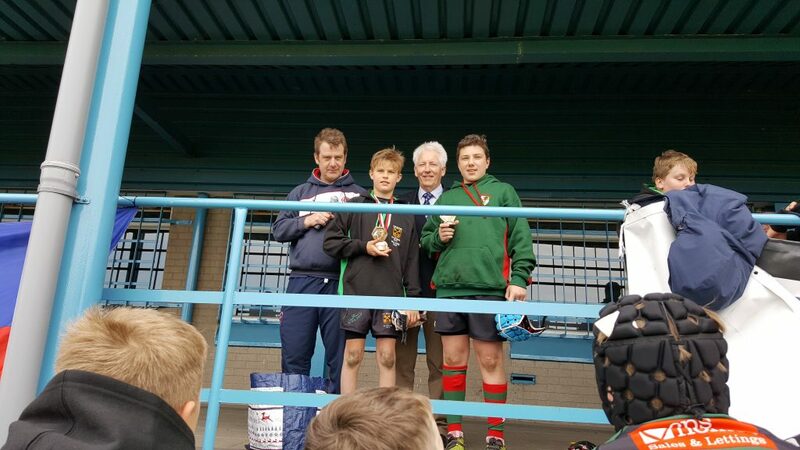 The ground was flat and hard and fairly dry and as Gareth the Caldicott head coach was presented the Thunderer . Mr T, the other coach, who had run twice down to the Harlequins to pick up the minibuses after another good night sampling just about everything that Cardiff had to offer had somehow left his bankcard in Roath and it was still there. After two days this truly is a rarity – believe me. I hope he can justify those extra purchases at the end of the month. Whilst this report has been heavily edited, in order to prevent Denfa’s true literary genius coming to the fore and preventing the early retirement of Ms Rowling. This next line is an example of Steptoe’s genius and must truly be read three or four times to understand it’s meaning. the game this time was i think in everybodies mind both teams and supporters going to be a lot more open and favour the fleetfooted amonst the shirts of both teams . Caldicott’s enthusiastic presence was felt from the start and battle resumed- this time the encounter was more of a desert battle of wits; Rommel v Monty. Occasional skirmishes into each other’s territory with hardware and more tactically astute decisions affecting each onslaught. One being the Caldicotts gaining of the rules whereby they twice catching the Rocks off side by holding the ball at the line out – however well done to Gareth for not giving the offside and letting the game flow. Acme’s leading product was again not being used unless injury or a rest was needed (by the ref that is). The relentless Caldicott attack kept coming; wave after wave being undone by a slip of a pass, a slight knock on, a little off side but eventually the Rocks succumbed to the inevitable and Caldicott again drew first blood. Five – nil. St. Peters hung on. Not without forays into the opponents half only to be thwarted by strong defence and some great kicking which was absent in the first game where to drop the ball would simply have resulted in watching it float away. For only the second time this year, the Rocks had a drop out 22, when the Rocks grounded a ball over their own line after Caldicott spurned yet another chance . A last effort at the other end saw the Rocks ending the first half with no score yet on the board as their only reward for their efforts. Caldicott were somewhat flummoxed at why they only had five points after such Herculean efforts and so much possession. Many changes were made by both parties; armouries refreshed. Let battle commence. The walking wounded retreated to the arms of their loved ones – tears dried and egos massaged. The children also needed some comforting. The end game started with sorties to both ends of the plastic patch and returned spoils even. The Rocks plundering and gaining no ground – the same fruitless results were experienced by Caldicott until a spark of brilliance from the Rocks levelled the score. Five all. By now the shirts nerves on both sides shattered. Supporters, coaches and generals were all trying to get a bridge head from somewhere. Finally the stale mate broke again! Wales 10-5 England. The last play was called and The Rocks broke again to cross the white wash with a rollicking effort. Gwaith Dda 15 – 5 The die was cast and the result stood. I haven’t mentioned any St. Peter’s Player in this report as this was a complete team performance by every single shirt all thirty one of you. 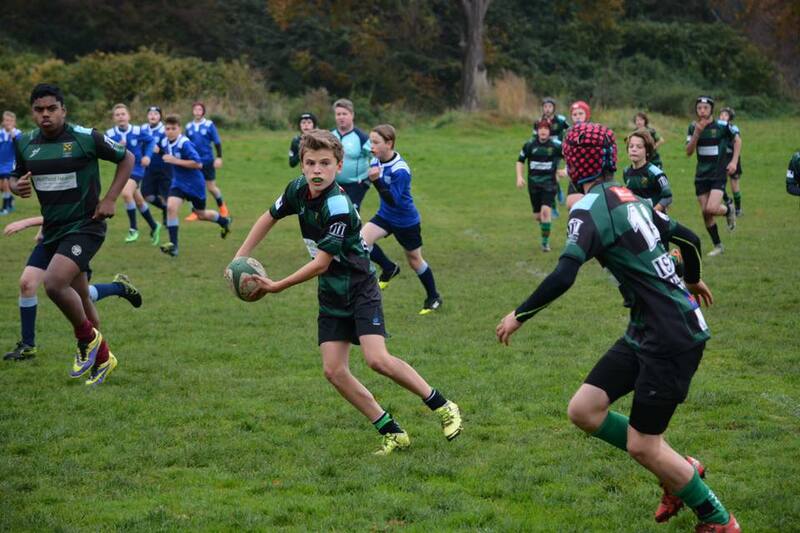 Two hours of rugby played with a skill level rarely seen at Rocks senior level, let alone under twelve junior rugby. The game is in safe hands when shirts play for the love of the game and use the skills and techniques they have gained under the tuition of their coaches. Caldicott’s players good-spirit, pleasant demeanour and respect for their hosts will be the overriding memory for me. “Manners maketh the man!” The St. Peter’s shirts saw rugby of a completely different standard being brought to our fields. Lessons in how to defend, how take your time, how to take your chances when they come, never give up and trust everyone in your side is a lesson that needs to be earned. It can’t be coached. That characteristic – that personality trait comes from within. I hope that we get to play Caldicott again on their patch, under their rules. This should not be an event but a relationship that should be encouraged and continued. I would like to thank, Bruce, Pappy, Cris “the Pembroke Massive” Mike Weston Gareth and Mr T – the sports masters of Caldicott for all your efforts. Let’s make these exchanges a yearly event… This was a long winded report, I agree and some of the descriptions are (possibly) a little over the top. It was a great weekend of junior rugby on a weekend when the other side of the game (international rugby) was left looking at itself as a result of over coaching, set plays, size over substance and selection criteria that tries to do the right thing but seems just to confuse everyone. This is still the only true team game there is. Let the children play – and watch the game develop into the game it deserves to be. The game we all love to play, watch and of course – have an opinion on ??? Rounds one and two: two games this weekend against probably the most awkward team we have encountered! I say awkward, as we know nothing about them apart from they’re from a private school down South, and the Pembrokeshire massive had arranged a get together with the folks from St Peters hosting their shirts … Caldicott had taken care of Saturday by hosting our team at the Japan match which was a lovely gesture; the Friday match under lights at home with puddles the size of Roath Park lake in a drought took place in the wake of storm Angus and with St Peters fielding all 31 players against a rather smaller squad of 24. Caldicott deciding to receive the kick off, all hell broke loose with wave after wave of attacking rugby down the 15yard line, forwards taking the ball up and recycling, ploughing forward, popping off, loading at will against a stalwart, if somewhat shell shocked Rocks defense; the try line being defended Somme-like, a yard gained, a yard lost! The handling and defense by the gladiators from both sides took the breath away, Steptoe refusing to blow his Thunderer from sheer enjoyment of the bloody muddy spectacular that was unfolding in front of the brave spectators drenched in south wales fine rain “you know the type”, the rain that soaks you through to the skin without seeming to penetrate your best Burberry, but has the knack of somehow making your armpits moist and the small of your back cold as if your sweater was exposed to a draft, ” any “old-up” the whistle blew and a scrum was awarded to our visitors from England’s green and pleasant land. Not ever having an 8 man scrum saw both flankers make the front row five strong. Reset after some light coaching saw the scrum half pass a rocket of the pass out to the out half, fullback swiftly passed it out for the only tackle to be half committed, the player went half down popped one out for Caldicott to get their reward: 5 nil to the valiant visitors. The game resumed with the Rocks’ coaches calling their men to arms, rather like the 24th and 41st of foot at Rourke’s Drift. The game this time was played in the pool half of the pitch, with the ref having to stop the game every time a tackled player was in the need of mouth to mouth resuscitation, after getting the bends twice the first aiders had to come on with life jackets after the flairs were fired. However hard the Rocks tried to breach the Maginot line they were repelled; half time was called and Caldicott’s kit, which at the start of the game was a brilliant white, had turned the color of the arena. St Peters made 15 changes to the team and the game went on much in the same vein, St Peters gaining parity after 2 minutes with a slick handling move down the centre: 5 all. Again steadfast and true the game went with the same agenda, hard rugby played by hard young men doing their best in the conditions. St Peters again broke free from the mire with a 60 yard flourish: 10:5. By now the fresh legs had made their mark and the weight of the Caldicott shirts dragging their shoulders down with sodden cotton. St Peters by now had gained the ascendancy at the break down and without little effort from Caldicott, who gifted not one yard, the result was finalised by 2 further tries ending in a score line rather flattering the St Peters shirts . . on another day and with the rub of the green the score could have been the other way ………. after hearty cheers from both sides and a full team photo under the posts the moon shone down on 55 players that had given everything they had. The post protectors were dragged half a mile to the lock up, the lights switched off, the rain poured down, and Guniness, porter, cider and ale was consumed at the club. The supporters took heart with tales of daring do from the past and watched as both sides appeared from the showers clutching their bags, eating sausage and chips, and wondering where they were going to sleep and whose house and hosts would take care of them till morning; the St Peters’ boys to keen to know who their xbox opponents were going to be … plaques presented, and speeches were made. The coaches of Caldicott keen to see what else Cardiff had to offer the evening ended with the prospect of rugby dwindling with another down pour of biblical proportions, Noah was seen in Splott building a boat. The next day after an evening of banter, food, and mums washing and drying any underarmour, kit, boots, ruffling their host’s hair and making sure their wards were warm and fed. Every one refreshed met at the old Julian Hodge building, now a hotel: Holland House or the Mecure Julian, being a former patron of St Peters (another coincidence, quite accidental). Japan V Wales: the less said about that encounter the better, although I know for sure there was more rugby at the harlequins the evening before!!!! Mike Weston conjured up a venue for the return game down the House of Sport 4g pitch he had drunkenly bid for at a charity auction; cheers mike, fortune favours the brave, or was it tequlia !!! Sunday brought the rare glimpse of the current bun and the array of Chelsea tractors on show brought parts of Canton to wonder if Abramovich had put in a bid for Cardiff City, again the Caldicott faithful had turned out and a few Rocks had been injured so they were down to just 28 shirts. The ground flat and hard and fairly dry, and with Gareth the Caldicot head coach given the thunderer. Mr T, the other coach who had run twice down to the Harlequins to pick up the minibuses after another good night sampling all what Cardiff had to offer, but some how leaving his bankcard in Roath: and it was still there after 2 days, a rarity believe me; I hope he can justify the odd purchase at the end of the month. The game this time was I think in everybody’s mind, both teams and supporters, going to be a lot more open and favour the fleet-footed amongst the shirts of both teams. It did not dissappoint! Again Caldicott’s presence was felt from the start, and battle ensued, this time more of a desert battle of wits, Rommel v Monty, skirmishes into each others territory with hard ware and more tactically astute decisions; one being the Caldicott’s garning of the rules, twice catching the Rocks off side by holding the ball at the line out, however Gareth not giving the offside and letting the game flow. The Thunderer again not being used unless injury or a rest was needed (by the ref). Caldicott kept coming, wave after wave being undone by a slip of a pass or a slight knock on, eventually the Rocks succumbed to the inevitable and Caldicott again drew first blood: 5:nil. St Peters hung on, not without forays into the opponent’s half thwarted by strong defense and some great kicking that no one saw in the first game. Drop out 22 was seen only for the second time this year when the Rocks grounded a ball over their own line after Caldicott spurned another chance. A last effort at the other end saw the Rocks ending the first half with nil as the only reward for their efforts, and Caldicott somewhat flummoxed at why they only had 5 points. Many changes made by both parties and armouries refreshed the battle commenced, the walking wounded retreated to the arms of their loved ones, tears dried and egos massaged, the end game started, sorties to both ends, returned spoils even, the rocks plundering and gaining no ground, the same for Caldicott. Then a spark of brilliance and the Rocks equalled the score: 5 all. By now the shirts’ nerves on both sides shattered, with effort supporters, coaches, the generals, all trying to get a bridge head from some where; the stale mate broken again! Rocks 10:5. With the last play being called, the Rocks broke again to cross the white wash with a rollicking effort: 15:5; the dye was cast and the result stood. 2 hours of rugby played with a skill level rarely seen at senior level, let alone under 12 junior rugby; the game is in safe hands when shirts play for the love of the game, use the skills and techique they have gained under the tutelage of their coaches, the life lessons their parents have given them and the unfettered loyalty to each other, the respect of the enemy of the day. This rugby at its best, un-spoilt, each team giving everything they have and coming off the field of play shaking hands congratulating the winners and commiserating with the vanquished, no one gloating, no one feeling down as the games were played with spirit and nerve. I haven’t mentioned anybody’s name in this because this was a complete team performance. Both teams have gained so much from this tour of South Wales Rugby bon amie and fair play by all for all. The Caldicott’s players, good spirits pleasant demeanor and respect for their hosts will be the overriding memory for me — “manners maketh the man,” the St Peters shirts seeing rugby of a completely different standard being brought to our fields, lessons in how to defend, how take your time, how to take your chances when they come, never give up and trust everyone in your side, a lesson that needs to be earned, it can’t be coached. I hope that we get to play Caldicott again on their patch under their rules, this should be an event, a relationship that should be encouraged and continued. I would like to thank, Bruce, Pappy, Chris “the Pembroke massive,” Mike Weston, Gareth and Mr T, the sports masters of Caldicott, for all your efforts, let’s make these exchanges a yearly event ……. A trip up the valleys today for the club’s first encounter of Cup rugby. Saw us entertained by the OLD FIRM, Mountain Ash, a club with a lot of history and pride. Two former St Peter’s players spent 5 years there in the late nineties, Darren Dummot and Jason Brown; Darren captaining the side. It was a cold windswept bright morning with Chris braving the elements in a Tee shirt; when offered a jacket he didn’t shirk the offer and Ant gave him a Rocks Hoodie, a little snug but warmer than bare skin. The game started well enough with both sides getting stuck into their game with the Ash exposing our deeper channels with kicks behind, a part of the game we haven’t worked on and will have a close look at soon enough. Some bewildering decisions on the floor at the jackle gave cause for concern but the discipline by everybody was a credit. The set piece is where we excelled and Buffers pick up and go down the right side blistering pace and a score. Ben Elliot popped over a great conversion out wide right and the boys reset themselves for the kickoff without celebrating, knowing the job was far from done. A good kickoff was returned to the centre of the park for us to be penalized again; opting to run the Ash gained some ground but their play broke down with the rocks forcing the ball sideways and scruffily down the park, but quite effectively. A line out to the rocks saw the Ash so far offside that Eamonn got caught with the ball by their outhalf as he received the pass from Gruff who we all know can pass the ball like a rocket: missed again by my friend!! The game staggered on for a while with the Ash never looking comfortable. We got a penalty that Ben kicked for a great touch. A sweet front line peel created forward momentum with Saul and Buffers combining well, breakdown recycled and Buffers scampering over unopposed. Ben the boot slotted over a standard kick this time, 14 nil. Half time came and went with the coach’s pointing out a few errors and the game restarted; “Westy being replaced by Matt Williams” due to dead arm. In very much the same vane we lost the ball in contact a little too easily and the jackle had to be so clinical that my friend had to relent, and even commented of that’s how he would like to see it? Kane got his obligatory try with a nice angle and a strong brake of tackle to score under the posts with Ben again slotting it over, 21 nil. Time to make a few changes KD coming on for Gruff whose service was fantastic all game. Popped close balls ensued and a sort of forward ground making game happened. A nice scrum with Saul pinching his third or fourth ball against the head. With Joel being subbed the ball slickly made it way to the wing and with a text book 3 on 2 put Geggars free with a glide passed the winger ran in a 70 yarder; Elliott on song with the boot made it 28 nil. All changes where then made with Joe, Ioan going on for the forwards, Will replacing Eamonn whose game got better with time and some lovely half breaks and deft passing exposing the Ash. Finners coming on for Clarkie who was the only back to make strictly forward momentum. The game won and the Ash desperate to score the defence stuck firm and the Ash also snuffling out the boys efforts saw the game come to end on a freezing cold day that might have contributed to a less than sparkling performance that on another day could have seen many more trys and fluency happen. A different interpretation at the breakdown on the floor frustrated and bewildered players and supporters alike. However the turnover count was about 70% St Peter’s with the usual suspects getting their hands on the ball and offering them selves up for attention: Bedders all game, Saul and Mathew Williams in the second half, and Nick keeping every one calm and thinking about the next part of the game. Everyone played their part and there will be few changes against Rhiwbina next week, but the team will have to play collectively better than today to eek out a scoreline. Thanks to the travelling supporters Ted, Ellis, KC, Tomd for coming; that game was for you boys, let’s have a nice week and be ready for some beasting with Chris on Friday night and some slick depth handling drills from Aled. Ant hopefully will get some time of work but he’s on 12 hr nights. Well done troops, 1st round blues cup in the bag chuffed and proud, Denfa. OK with 2 games won, Cowbridge 64:5 and Rhymney Valley away a scare but a great lesson with a 7:5 win. Great respect to the valley as they always play hard and fair, but every team needs hard games and this was just what the doctor ordered; a great performance from the 2nd half team chuffed ..
NEXT HALF STARTED AS IT the last ended with the shirts barrowing down the field with players both forwards and backs involved finally big Joe T over unchallenged, Dungy appeared again from nowhere to run another 60 yarder in handing off and galloping down the field like the preferable demented giraffe when its right its right and watching him in flight is awesome. However the boys had learnt and every time he had the ball after they let him start then corner flag him and took him on from the side, Kai in the first half Bedders in the second half after Bedders had been shown a nice hand off other players kept there cool with Joel going really low and brought the big fella to his knees. Coming on to Joel he slipped from flanker to center outside Clarkie and them 2 different styles but complementary. Joel finished of one try with a deft dummy to Ben Elliot that I thought he had passed it Ben Ell slotted that on over no probs. Restart and KD returned the ball 40 yards recycled by the forwards out along the line Joel try number 2 . . They kicked back with KD returning the ball again 40 yards down the left recycled again but this time on the blind KD popping up to finish what he started “i know a song by the same title “ poor old Ben all his cons out wide but he made a great effort and his technique was growing just falling short. He wasn’t finished. However from the restart he ran 80 yards brushing of players a dummy looked for off-load half tackled three times got scragged at the end laid it back for the ball to be cycled; I thought on the blind Finners heard Math Taylor shout for the ball took a great angle that big Kieran Reed would have been proud off to pop over un-opposed, Ben Elliot slotting this kick over with ease. That brought the whistle to the end of the game. Just a really good effort; all the 31 boys turned up and 31 played; every one as good as the next man. Jesus it was fabulous, everything is slotting into place just at the right time ant Chris, Aled great work and Sam. It was lovely to big Conner come to watch, he’s been away camp America and with an earing in his nose and one in his ear he was indeed camp. But he is now playing for Swansea so Chris might turn up next week with a nose stud ??? The unselfish play today was what we asked for and it proved it with 9 different try scorers cheers all Steptoe. Three games in and 11 different try scorers: totals 124 points for 20 points against. The fifteen aside game is upon us and the signs are really positive. The Monmouth game away started and ended our pre-season after Llantwit Fardre pulled out due to football commitments. This brings up the conundrum of what the shirts do in school and their clubs. Football, rugby, cross-country, tennis, hockey and other commitments; I am as guilty as the next. Try your best to manage their sporting commitments. We all want the best for all the shirts. You can see by today at Rumney that injuries will play a big part in the whole season and players wanting to be rested at half time? I am fully aware they want to do everything, but you will have to manage their extra curriculum activities the best way you can. (Rest is as important as game time.) All shirts will be expected to train on fridays to be available for selection. Luckily enough our squad size is in our favour and we can rest players on a sunday by having only half a game that is in our favour by a long chalk. Getting back to the rugby; overall the shirts are getting to grips with the acre of ground they have to cover and as coaches we asked them to get the ball out wide and use the space, which they have done in the first 2 games. Today was a little narrower. The game plan is coming together, though there are still a few shirts watching the breakdown instead of making the right decision crowding the breakdown area. This is going to be a problem when we encounter a side that has also worked at this area. Forwards in the way after they have done their job there, in the way of the backs, so slick ball that the forwards have worked hard for can’t be used … All in all looking at where we are compared to who we have played we are ahead of these sides. But we will come against a side who have worked out the 15 aside game soon enough! That will be the acid test. The only disappointing aspect of the three games is players are asking to be subbed : these are shirts, who I know last year would never have dreamed of such a thing. It’s because they’re cream-crackered. Results: played three won three; trys for 22 trys against 4; 3 of them scored by a 14 year old boy waiting for his side to train up at Monmouth. It took a awhile but Gruff sorted him out by stuffing him back on his behind and Yardy winning the break down to let the oncoming shirt to score. He then picked him self up off the floor and decided that 11 year olds sticking him on the deck would do his street cred no good and trotted off to train with the under 15s. Monmouth done and dusted with Ben Elliott and Nick Thomas our captain then put into public school for the rest of the afternoon to bolster Monmouth’s side, the shirts ran out 40/20 winners scorers Nick 2, Kane 2, Clarkie 1, Will Hawker 1, Matt Evs 1, Salty 1. Old Pens next up a, better performance with both halves sharing the points, both sides we put out doing really well with shirts playing in positions alien to them doing what was asked and a better shape emerged: scorers Matt Evs, Kane, Bedders, Buffers in first half; Gethin 2, Amsey and Will Hawker in second half, with Bedders popping over 2 conversions and Ben Elliot getting a nice one from quite wide out, most trys scored out wide which was really pleasing .. This week Rumney Cardiff away. This game was always going to be tough with Rumney recruiting well in the close season, a physical game with the breakdown area so congested that Tony the ref could have blown up at every breakdown and penalized virtually every player. 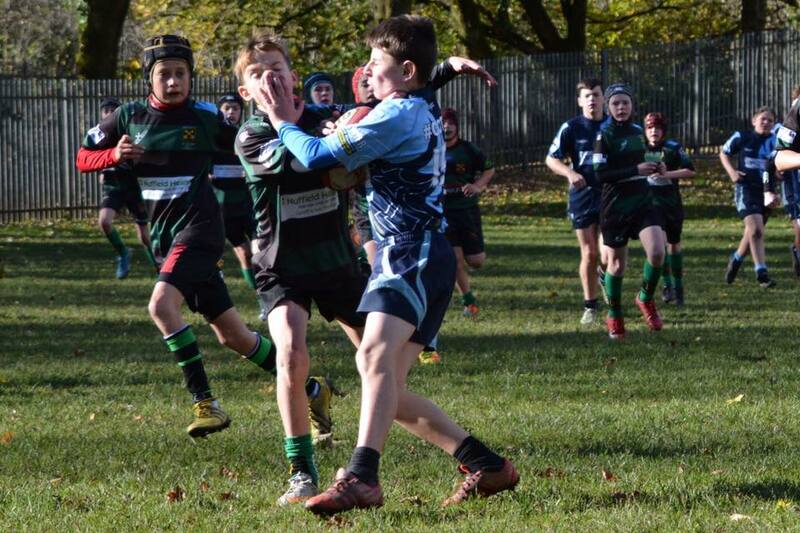 Rugby did break out in parts with St Peters finishing well and tackling their runners before they got started. Nil was the best result for the team. Some decisions we made were a little strange looking to take field position then running a quick one ? resulting in a scrum to Rumney 30 yards to the left of where we started. Field position even at 30 nil was the right decision gives the shirts a blow while the set piece is sorted and every one can calm down to take the game forward; but all in all a good result 38 nil; scorers Geggers, Nick, Gethin, Will Hawker, Bedders with Ben Elliot’s last try the pick of the bunch, 2 cons a piece by Eamonn and Ben Ell: see you all next week. The reports below contain a few of the images taken by our faithful team photographer John P. For those of you not on Facebook, he posts up a great selection from each game and also makes higher resolution versions available via Flickr if there are some you want to keep. Guess what…. Yep, it was yet another lovely Sunday morning. At some stage its gonna change, but for now, lets hope the sun keeps shining! Today we welcomed Croesy down to the Harlequin for the first time in a couple of seasons. We knew they were a strong side who play well disciplined rugby and expected no less today. The Rocks started well enough from the kick off and seemed to have the game under control with a decent period of possession, although there was clearly some nervousness in the early handling as a few errors crept into our game. The defensive line-speed was good, forcing Croesy to play behind the gain-line, but unfortunately some of the tackling left a bit to be desired as did the in to out drift we should have been employing. The lack of discipline in the line cost us as Croesy headed out left having spotted an overlap as a couple of our defenders had come inside rather than holding their position and trusting those inside them. These errors led to two Croesy tries, which were a little against the run of play in some respects, but the errors were costly. We also committed more handling errors in the back line during the first half than I think we’ve committed in the last month, which set us back and gave away possession in good positions on the field, but as the game went on, the Rocks started to claw their way back into the game. The ball started to move along the line and opportunities started to come Zak’s way out wide. Croesy had a quick winger, but not quick enough, and by half time the Rocks had managed to eke into a 2 point lead having scored 2 tries. Croesy scored early in the second half but the rocks came back at them and scored a further two tries to get our noses in front. Our large squad and commitment to try and give everybody fair game time meant that a whole host of changes were required, particularly in the backs. These changes didn’t weaken the side, but they did de-stabilise things. Its difficult for boys coming off the bench to get fully up to match speed, and for a while we struggled, which allowed Croesy the opportunity to score a couple more tries. In the dying minutes of the game, the Rocks were camped in Croesy’s 22 and time after time recycled the ball, and worked several overlaps, but with a bit of white line fever, the wrong option was taken on more than one occasion, which allowed Croesy to hold on to their one score lead. This was a really tight game, with nothing between the sides. The forwards played some really good stuff and 5 or 6 of them were up for MOTM. Our backs were definitely off the pace in the first quarter, uncharacteristically making unforced errors, which frustrated the boys. We got better as the game went on and started to get into the game. Developing such large squad of players is definitely a double edged sword – its great to have strength in depth and options, but ensuring game time is a headache….. We had 24 players pitch-side today and making a host of changes together will always destabilise a side. This is a coach’s nightmare, and the reason for our narrow loss today lies firmly on my shoulders. Everybody that came on played well and did their bit, and there were chances to score in the last few minutes that just weren’t executed quite well enough. Despite the errors, there were plenty of positives to take from the match, and it was a good game to watch with great respect and behaviour by both teams. As mentioned above, todays MOTM could have gone to any one of 5 or 6 forwards today. Jack had his usual stormer, Josh played a blinder, as did Harri and Efan. A special mention also to Nico who had what I thought was his best game for us after coming on, but todays MOTM went the ever reliable Tom(Icantbelievehesstillgrowing)Sinclair for a great all round forwards performance around the breakdown and titanic in the tackle area. Yet another glorious, but colder Sunday morning saw the team pointing their chariots north to the top end of the Rhondda valley to play Ystrad. We haven’t played Ystrad for 2 or 3 seasons and so it was going to be interesting to see how the sides had developed. It was our first time to visit Ystrad and we had a warm welcome to Gelligaled Park. The boys were clearly prepared and were happy to get going with their warm ups without any of the usual faffing about kicking the balls around. The wind was more than a little chilly, so it was important that the boys kept warm. 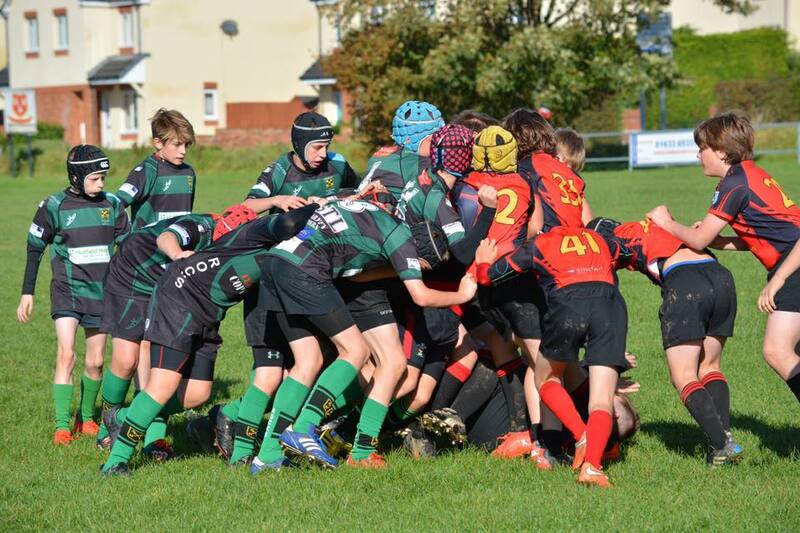 Ystrad started very strongly, making the most of their huge pack. You know they’re big when you can even see Tom S in the linout…. Their size (and associated weight) meant that they certainly had the edge in the scrums and were causing our boys real problems up front and after a few strong runs through the middle, they broke through to score. From the restart, Ystrad continued to make use of their size but the Rocks started to make a few inroads of their own. Ystrad were clearly on top of the early exchanges, but they landed a clearance kick on Zak’s head just outside our 22. He had ¾ of the pitch to go, but about 1/3 ot the width to play with, and he down’t need to be asked twice as he showed the Ystrad back line a clean pair of heals without getting into 3rd gear. The score gave the Rocks the confidence they needed to start really taking the game to Ystrad. A brilliant phase of play down the right by the forwards with the ball being offloaded and popped from one to the other pulled Ystrad’s defence out of position, and as the ball came back from a ruck on their 22, Nigel hit the ball at pace and burst through to score a top try. Ystrad clawed a score back before Zak again finished off another great move from the Rocks to take us in to half time 19-14 ahead. It really was a great game, with Ystrad having the edge in the tight, but Tom made one good decision after the other and dictated the game, including identifying the open space and executing a great cross field kick that allowed Zak to chase through and score again. Ystrad came back again (though the final pass looked a little forward) and just refused to let the Rocks open up a comfortable lead. We made a series of substitutions early in the second half, which brought a fresh set of problems for Ystrad to deal with. The tail end of the game saw their forwards tiring a little and the Rocks scored another two tries as we exploited the space out wide again. Josh was unlucky to have what seemed to be a good try to me, disallowed for a double movement. It was a really good game battled out by two strong sides. 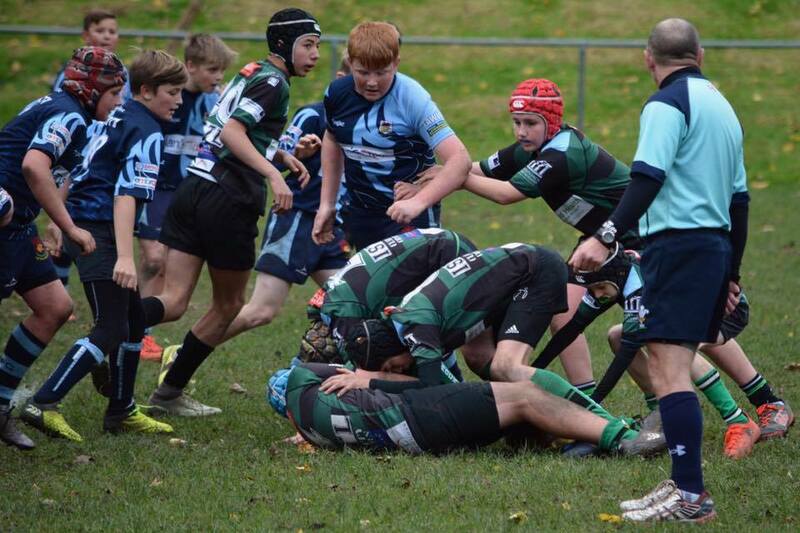 I’m glad it wasn’t raining and muddy – I suspect that Ystrad’s pack may have had the last word had the conditions been poor, but we couldn’t be happier with the effort, desire and execution the boys showed today. We definitely need to work on our restarts though as Ystrad scored at least 2 tries from us not fielding the ball effectively from the kick off. This week saw us welcoming a touring side from Plume Academy in Essex. They were on a tour that included various training sessions with the Blues and Ospreys, and were fitting in a single game against the Rocks on the Sunday morning. Its always exciting playing teams that you have no idea about their style and standards as you have to prepare yourself for anything. Plume kicked off to the Rocks, who fielded well, went through 4 or 5 phases of play up the middle, then sent the ball out left to Zak. Plume showed him the outside and he took it with relish. The Rocks then played 15 minutes of rugby without a single error that I saw. I don’t think Plume got their hands on the ball the whole time as the Rocks ran in another 5 tries before half time, fielding the restarts and heading straight back into Plume’s half. Half time score was 36-0 to the Rocks. So if I point that way, but go this way, do you think it’ll work? Towards the end of the first half and on through the second half, the ref started being a little more harsh on the Rocks, but to the boy’s credit, they didn’t argue or make a fuss, just accept the decision and move on. Plume saw a bit more of the ball in the second half and showed that they had a few good strong runners and were able to play some rugby, but the Rocks were just too strong and within 10 minutes of the second half the game was stopped. The gulf between the sides was quite sizeable today as the Rocks dominated each aspect of the game. It was a nice run out for the boys that allowed them to play a stress free game, but I don’t like to see a game stopped and I hope that Plume enjoyed it even though they were well beaten. After a night of heavy rain, it was great to see Sunday morning dawn bright and dry as we all pointed our chariots to the westernmost outpost of the region. The side has been beset by injuries in the last week with Harry G (ankle) and Harri P (knee) both sidelined with injuries sustained on school duties along with Dan’s enforced concussion protocol meant that whilst we had enough players, there were less to choose from than we’d like in such a competitive game. 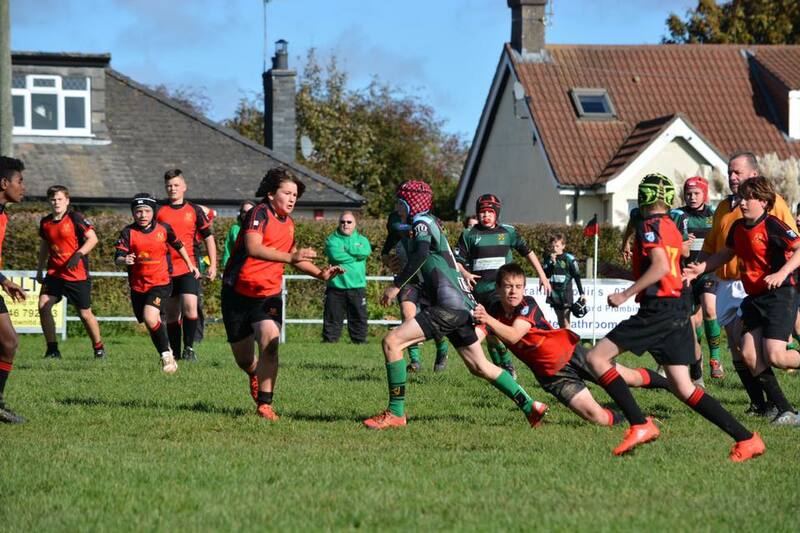 We know that Llantwit are a strong side that tend to play a fairly narrow game as they play to their strengths – they are a combative side that make other teams work for everything. And so it proved today as Llantwit started the more aggressive side. The Rocks were able to hold firm for the first 15 minutes, but were constantly being put under pressure and playing on the back foot. Our forwards did steal some great ball on the floor as we were quick to the breakdown (Jack & Ben C in particular doing well), but Llantwit’s power game was sucking in our defence time after time. A little more width in their game would have seen us 2 or 3 scores down by halftime, but as it was we went into halftime only down by 7 points. 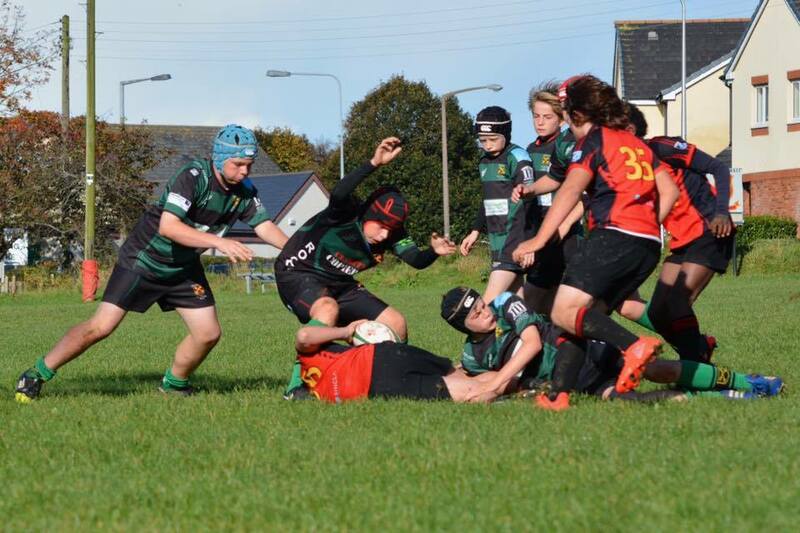 The opening minutes saw a significant improvement in the urgency shown by the boys, particularly with some excellent line speed putting pressure on the Llantwit backs behind the gainline that forced a number of errors. The pressure led to penalties as the Rocks started to squeeze Llantwit back into their 22, and following one of those, the boys took a quick tap and shipped the ball out left. The ball moved well, but we drifted far more than we should have forcing Zak to score out wide, making the conversion all but impossible. The boys kept up the tempo and the Rocks tails were up as they could sense Llantwit feeling the pressure, but the game was then stopped following an injury to Locky following what appeared to be a glancing blow to the head. The game was paused for a good half hour, and nearly abandoned, but as he recovered slowly, the decision was taken to try and finish the game. There was 10 minutes left and the Rocks were 7-5 down. The boys huddled together and motivated themselves – it was time to step up and take responsibility for themselves. And did they ever! Everybody seemed half a yard quicker, the intensity went up 50% as the Rocks blitzed every phase. 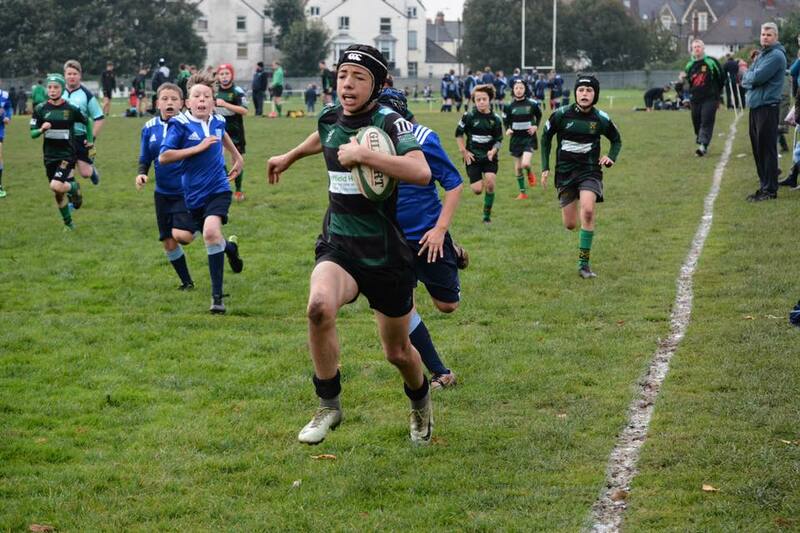 James P ran hard on several occasions and almost burst through Llantwit’s scrambling defence. Zak came infield looking for work and probed down the centre channels, but still they held firm, until the ball was once again swept out left and found Zak again, but in a bit more space where he was able to use his gas to great effect and score again in the left corner. The boys were now totally pumped. There was still work to do with about 4 minutes left and Llantwit now pushing for their own score, but the defence was good, the forwards really stepped up and made their hits around the fringes, they drove the mauls backwards and forced the errors with their sheer determination. A further knock on was forced through sheer will and the ref gave the nod that time was up. For some reason Efan was standing between 9 & 10 …. (have to correct that one! ), but fortunately he know how to boot a ball too and kicked it way off the park to close out the game. This was another of those performances that takes you through a whole host of emotions, from frustration at the lack of intensity in the first half, to relief of only being one score down, to further belief that things were getting better, to concern over one of the boys to relief again, to pure out and out desire and heart, and finally to the joy of victory. I don’t know about the rest of you, but I was totally drained after that match. The best news was that Locky was fine, but it was a great start to our Blues Cup campaign. Oooooh Oooooh Oooooh, do the funky Gibbon…. We didn’t really do a full debrief at the end of the game and didnt go through the MOTM with the boys. The award this week could again have gone to many, particularly for their heroic second half performances. Zak(flyer) Wall for another uncompromising performance showing just how much he has developed into a gifted player and classy finisher. But this week’s award went to a player who gave absolutely everything (particularly in the first half when we were struggling) and kept us in touch when things could have gone far more awry..
On yet another glorious dry sunny morning we welcomed CRICC over to the Harlequin field for our first meeting since a fairly feisty affair towards the end of last season that the Rocks won 28-0. Clearly some of the CRICC players felt hard done by on that occasion, so they were invited to referee this game themselves. The Rocks started off strongly, taking the positives from last week and dominating the early passages of play. We were rucking well and James had an armchair ride at 9, able to deliver the ball to Tom or the forwards with options in all directions. Big Nige was getting involved running the channels and soon burst through CRICC’s flailing defence to score under the posts. Zak then got in on the act as the ball was won cleanly, sent out wide to the left and he zigzagged his way through numerous players to score our second. Within a few minutes the ball came his way again, and this time he turned on the afterburners with an arcing run leaving the opposition watching him disappear into the distance. A fourth try came just before half time as Efan crossed after some great forward play. It was 26-0 at half time and the boys were cruising, so we took the opportunity to make a ton of changes all at once with a complete backline change on top of the forwards swaps. The sheer number of changes destabilised the team a little, and despite being competitive and coming close to scoring on several occasions (with Gwydd’s great catch from deep and counterattack a highlight for me), we weren’t able to add to the score. CRICC came back at us in the second half and probably had the edge at many of the rucks, meaning that we didn’t get as much quality ball. They applied pressure late in the game, and a small execution error meant that the ball dropped free as we were clearing our lines allowing them a consolation score at the final whistle. It was key that we built on the foundations of the tournament pool stages and last week’s strong showing against Llanishen. The boys played some excellent rugby, but the changes in the second half destabilised the team slightly. That’s not to say that the side was weakened at all, but making that many changes all at once did change the patterns and we had a host of players out of position and still controlled the game quite comfortably, which was pleasing to see. There are certainly things to work on before next week’s BC game, and a better team would have scored a few more tries today as we were exposed on more than one occasion, but managed to scramble the defence to shut it down. Its good to know that Dan is all ok after his shaky moment, but he will be rested for 3 weeks as we follow the precautionary concussion protocols. Yet again we had many names in the mix for MOTM, with Gwydd, Tom S, Harri Page, Ben C and Zak all having great games, but the control and delivery shown by today’s MOTM meant that the award went to James(Betty)Bettinson, who also managed to sell one of his famous outrageous dummies. Another fine morning for a game of rugby as we avoided the Cardiff half road blockages to make our way up to Rhydypenau to face Llanishen for the second time in two weeks. 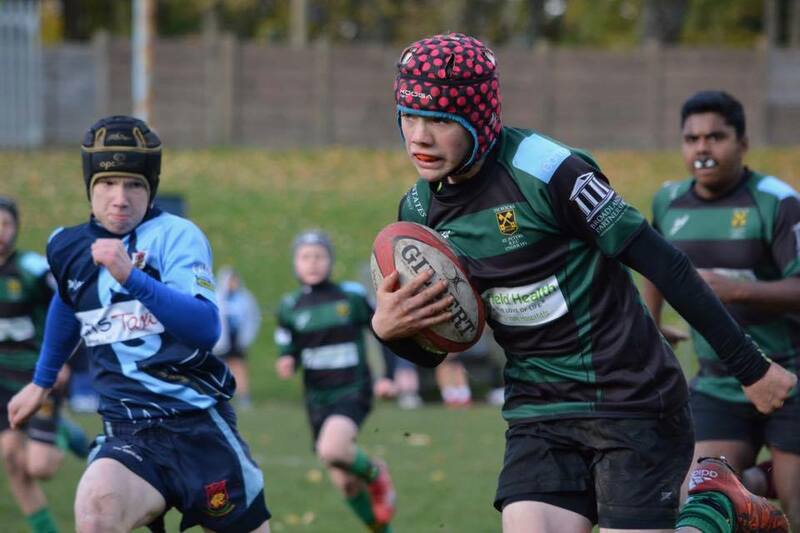 This was an opportunity for the boys to make up for last week’s loss at the district and try to gain some bragging rights over mates that play for Llanishen. A gameplan had been developed and the boys had all bought into it, but spirits seemed low during the pre-game warm-up. Fortunately, the first whistle seemed to wake the boys up and they took Llanishen head on, looking to front up and dominate close to the breakdown in the early stages. The initial phases of the game showed the pattern as the Rocks played 10 man rugby for the most part, looking to gain dominance up front. It was a hard fought and aggressive game with neither team giving any quarter, like two heavyweights jabbing and moving, looking for the opportunity to land that knockout punch. But both defences were up to the task and whilst the Rocks were battering Llanishen’s line at the end of the half, the whistle blew and it remained 0-0. As we had established parity, it was time to unleash the beasts in the second half, and the Rocks came out snarling. The first phase of game swept left and after some strong carries, Prendy got his hands on the ball after following up the crash ball and was able to use his gas to cross the whitewash…. Stalemate broken and the Rocks were ahead. Tom converted with ease and the boys headed back to face up. The Rocks had stunned Llanishen a bit and were soon at them again as big Nige burst through a tackle to cross for a second time in quick succession, opening the Rocks’ lead to 12 points. The Rocks seemed dominant at this stage, but Llanishen being the strong side that they are started to claw their way back into the game, and tried hard to get the ball out to their large winger, which they eventually succeeded with and he crossed the line, only to knock the ball on whilst placing it down. Whilst it felt like a let-off for the Rocks, Llanishen used their disappointment as motivation and shortly after crossed to score. A second try followed a few minutes later, and the conversion pushed them into the lead. The Rocks came back at them in the latter stages, but eventually ran out of time. 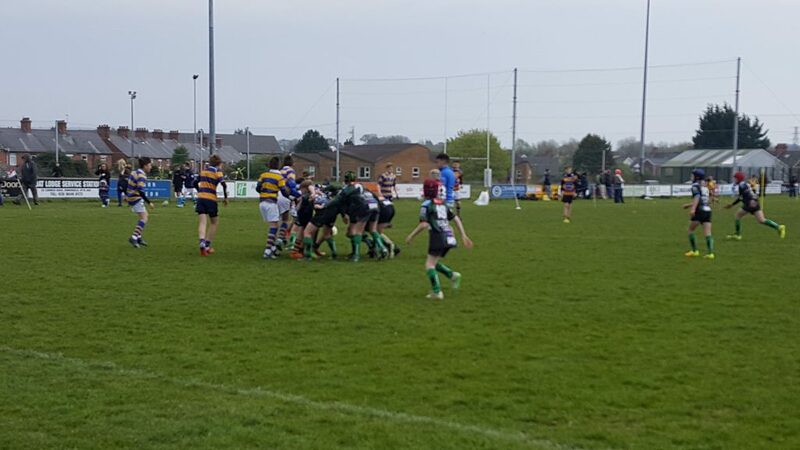 It was a great performance by both sides, and the quality of rugby on show was of the highest standard as two of the district’s heavyweights went toe to toe. Unfortunately the result didn’t quite go our way, but the boys can be proud of their performance and that there was nothing between the sides on the day. There were plenty of good performances today across the board again today with some stunning efforts put in across the park, but todays MOTM award went to Rhys(crashbang)Bulmer for a superb first half performance leading the Rocks line and shutting down Llanishen’s dangerous backline. We all headed off to Barrybados for our district tournament this year. Once again it was held far too early in the season, which is a shame as it demeans the tournament. It really should be held in April to give the teams something to build towards. The wind was blowing an absolute hooley as it swept in off the atlantic having nothing to slow it down since it left America….. Regardless, we went there to defend our title to find ourselves drawn in a tricky group that included Rumney, Pentyrch, Penarth and Llandaff. The other pool was a far more mixed affair and that also had one less team that meant less games for them to play. Big Nige (3), Jack Lock. 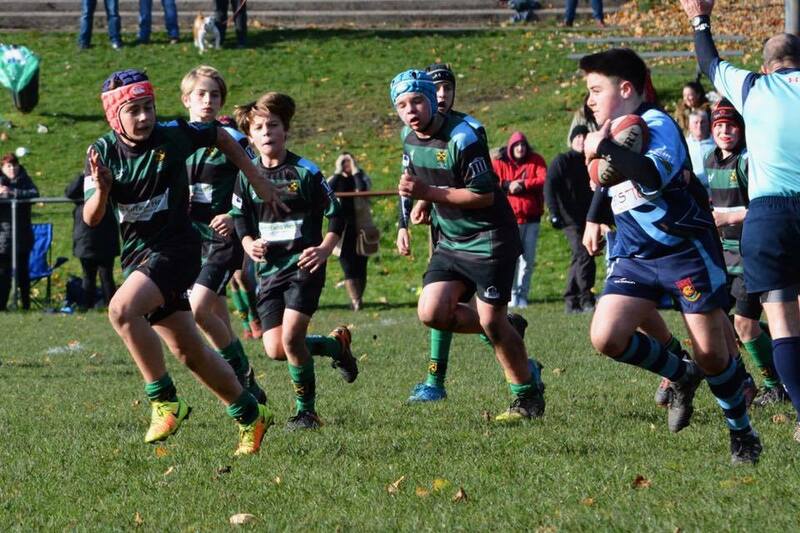 Penarth had brought a strong forwards oriented squad with a whole host of large boys. Their size had told as they had used their power to overcome Pentyrch in their first round match. Again, the Rocks won the toss and elected to play with the wind in the first half. Once again, the control was superb as the rocks were up and clearly dominating the opening exchanges. The kicking game was working a treat and the boys were able to run hard and create spaces out wide for our speedsters. We went in a half time with a healthy 19 point lead, but knew that turning into the wind would make for a different game. And so it proved as Penarth started to apply pressure. Some of our defensive work was not great in the back line as we left doglegs in the rushing defensive line that allowed Penarth to punch through and then work the ball wide. There were a couple of unfortunate errors that heaped pressure on the Rocks and Penarth were back within a score after scoring a 2 tries of their own. Time was running out and the Rocks played smart rugby to manage the last couple of minutes of the game, keeping Penarth in their own half. The boys were glad to see hear the final whistle blow as the last 5 minutes had been very tough against a strong pack and a huge wind. We hadn’t played Pentyrch for quite a while as our scheduled games last season were called off for bad weather. 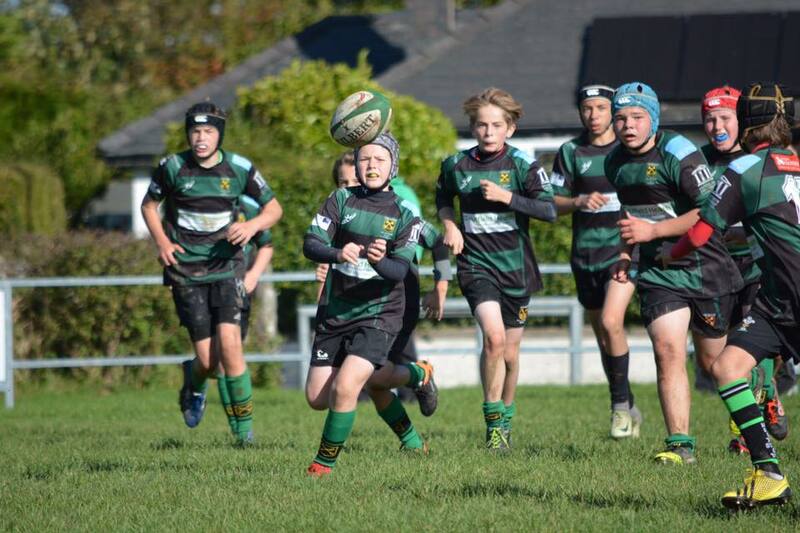 In past years, Pentyrch probably had the edge on us overall, but our team has developed a lot since U11’s and it would be interesting to see how the sides matched up. Whilst Pentyrch tried hard, they were no match for the Rocks at the 15 man game as we dominated almost all aspects of the game, with our forwards being aggressive at the breakdown it created space for our wingers out wide who exploited the space brilliantly with Zak & Gwydd both scoring brilliant tries, and not to be outdone, the forwards managed to bag one down the middle via Efan. All in all it was a comfortable win for the Rocks. Having won our first 3 games, we knew that we were already through to the knockout stages, so this game was a bit of a dead rubber. Unfortunately, the boys knew this too, so I think that the intensity levels dropped from the heights of the last 3 games. 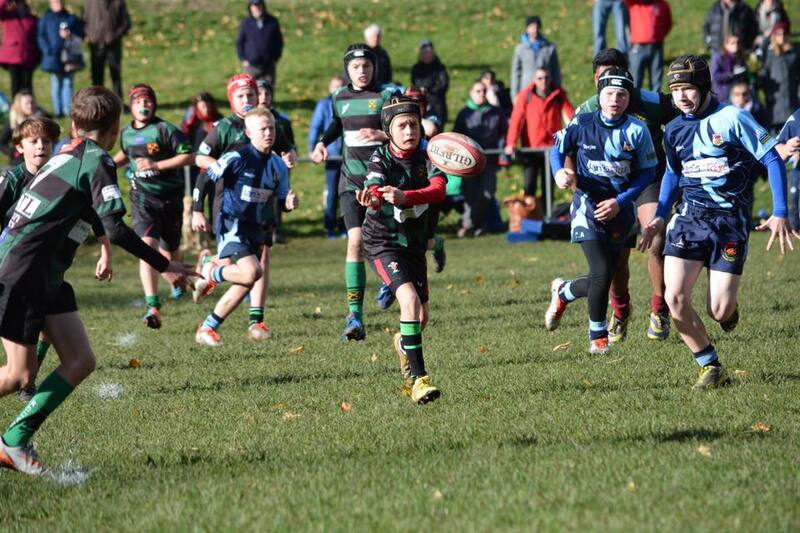 We were under pressure from the start, and as Llandaff ran into the wind and kept the ball in hand, though we had a bit of luck early with a good interception try scored by Harry G against the run of play. Llandaff are a good side however and kept their discipline and kept coming back at us. As the intensity of our performance dropped, so the tackles became softer and softer and we were half a yard slower to the breakdown. This allowed Llandaff the space to play their expansive passing game, and they cut us to ribbons, scoring 4 tries. Once the intensity goes, its really difficult to reignite…. Regardless, as a result of losing the game to Llandaff, we drew Llanishen in the semi final. We also drew a ref that tends not to favour the Rocks…..
Whilst moaning about the lack of a break during the pool stage above, ironically, having a long break before the knockout stages didn’t help us either. The boys were clearly off the pace in the first half and struggled to get their intensity back up to normal levels. Llanishen are a ruthless outfit, than have the skills to exploit weakness, and the combination of tiredness and being a bit off the pace allowed them to dominate the first half, and stretching into a 12-0 lead. The second half was a much better performance by the Rocks as we started to compete again at the breakdown and the tackle area. 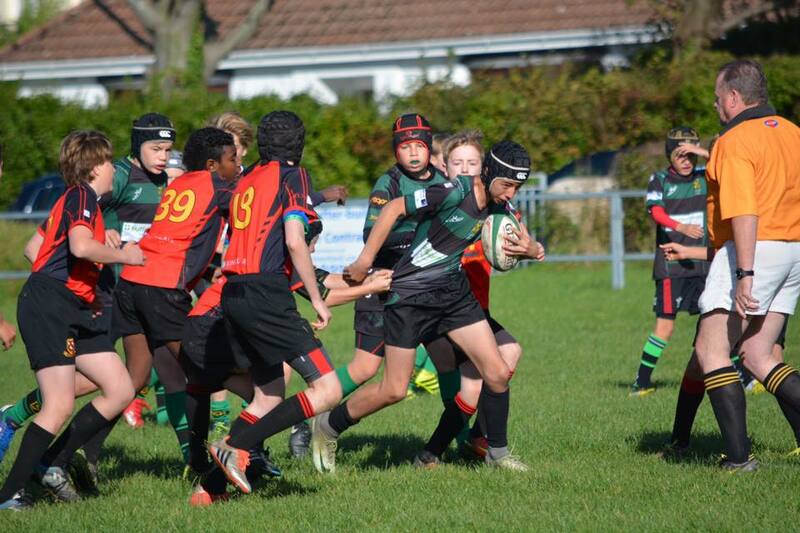 Unfortunately, we had left ourselves too much to do, and Llanishen were able to use the wind to their advantage when under pressure and knock us back into our own half. Llanishen went on to win the tournament, comfortably beating Llandaff in the final by 4 tries (I think). All in all it was a mixed bag of a day, with some excellent rugby played in the first 3 games, and then going off the boil a little. 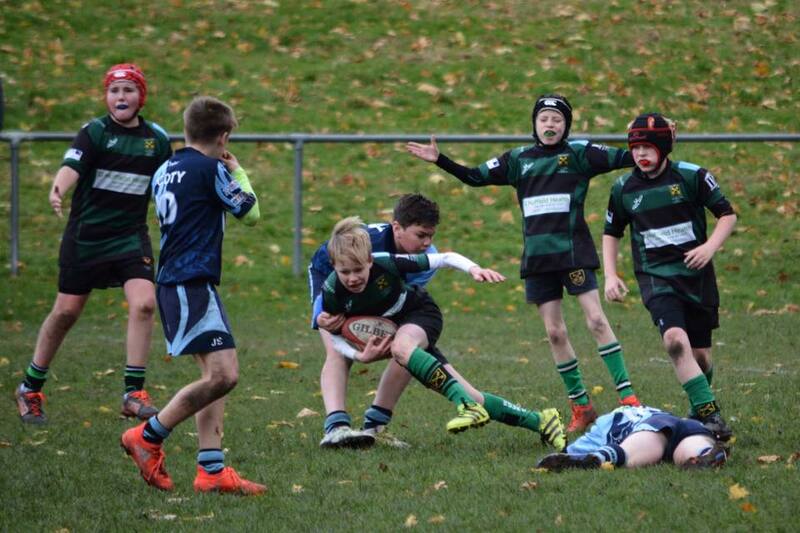 It is a disappointment to know that we can play better than we did against Llandaff and Llanishen, but that’s sport, and whilst there are some factors that you can point to (more games played, tiredness, etc. you cant argue that Llanishen didn’t deserve to win it). 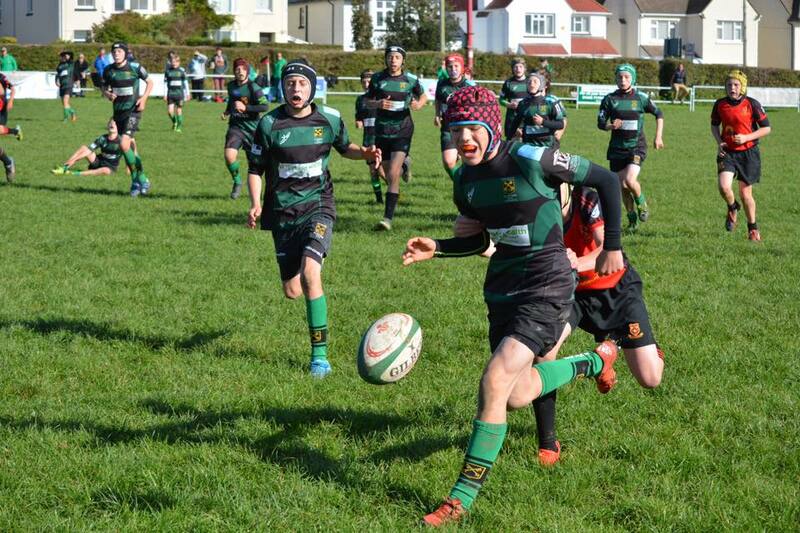 Next year…..
Next week, we play Llanishen again in a full game, so may be an opportunity to regain a little pride…. Another fine morning for a game of rugby as we welcomed local rivals Rumney down to the Harlequin for our first home fixture of the season. Rumney always bring a tough and combative side, so we were expecting far less time on the ball than we had last week. The started where they’d left off last week, and were clearly keen to try and impose themselves on Rumney who had a couple of large boys in their side. The boys got stuck in at the breakdown and were on top of most rucks as they seemed to have half a yard on pace to Rumney’s pack. 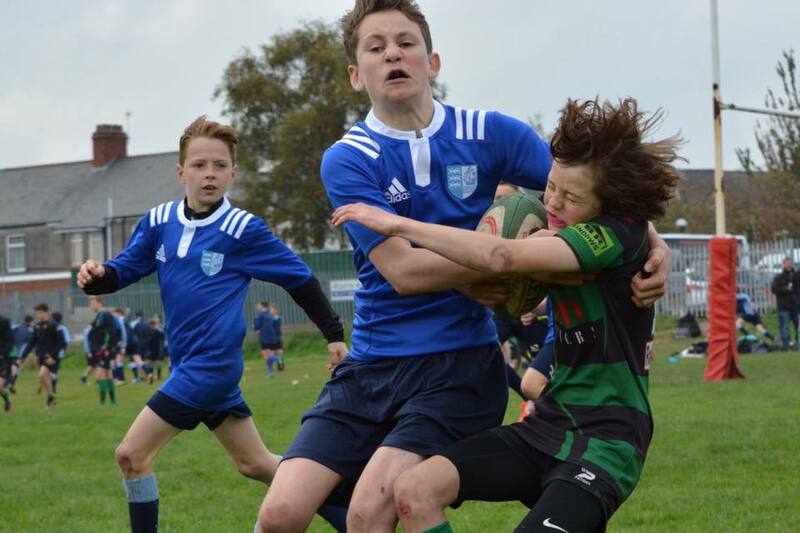 We are still sometimes guilty of being lazy at the ruck with boys leaning on or watching proceedings rather than either getting into position or hitting the ruck and driving hard. When the ball came back our way, the backs had plenty of opportunity to to use the ball, though in the first half we were guilty of offloading too early and not committing the Rumney defence, allowing them to drift and take away our speed advantage out wide. In the second half, the backs straightened up their running lines and were forcing Rumney’s defence to make decisions, which allowed our boys the opportunity to get the ball wide and create one on one situations. Our forwards were aggressive at the ruck and the game was pretty much under control from a short way in. We left 3 or 4 tries on the park as a couple of the boys came down with a dose of white line fever as we blew 2 or 3 man overlaps. All in all, we cant complain – it was a good win and another game without a try conceded, but we know that the boys will need to be far more clinical against some of the other sides we will face in the coming weeks. Next week we head off to our District Tournament to defend our title – yet again held far to early in the season to be meaningful, which is a shame as it really should be something to build towards. Well, what a great way to start the season with plenty of sunshine around as we made our way to Old Pens for an early kick off. 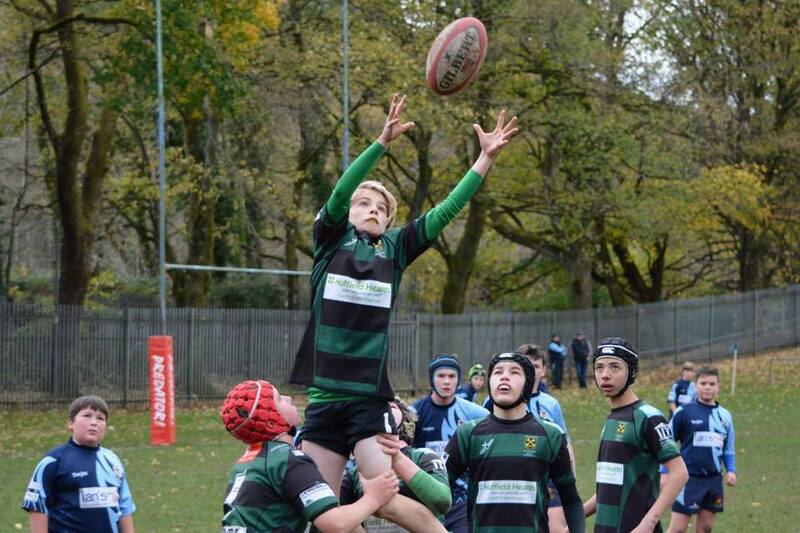 There aren’t many rule changes this season as we head up to U13’s – the principal changes revolve around the lineout, where it will remain uncontested, but lifting is allowed as is establishing a drive from from the line. Summer training has gone well, and you could see that the boys were ready for a ‘real’ game. We were hoping for a good game to blow off a few cobwebs and start to ramp up our season quickly as we build towards yet another early district tournament (only 2 weeks away) followed by a series of 3 Blues Cup games to be played before the end of November. The boys started well and got into their stride straight away with some good handling and direct running. The defensive line-speed was excellent as we swept up in a fast line to put loads of pressure on the Old Pens each time they had the ball, forcing error after error behind the gainline. The breakdown work was pretty good for the first game of the season though we tended to over-commit early in the game putting 4-5 players in the ruck when 2-3 would have been sufficient. It was pleasing to see the boys’ decision making coming along nicely as time after time they probed for the weakness in Old Pens’ lineup and then more often than not targeted the right area. The forwards won plenty of turnover ball and made good ground and the backs were able to exploit the space out wide. We did tend to drift a little in the back-line, which allowed Old Pens to drift – something we will need to keep working on since it meant that almost every try was scored out wide, making the conversions really difficult. Overall there were some really good performances today, 8 tries scored, 4 by forwards and 4 by backs, which shows that our game had a nice balance. As a season opener it gave the boys the workout they needed. Next week we face Rumney, who will undoubtedly apply more pressure and the boys will need to step up a gear or two in order to meet the challenge face on, but as season openers go, this was a great start.